I’ve often complained to my colleagues that we pay far too little attention to negative results. Negative results from our data don’t tell us as much as positive results, but that hardly means that we learn nothing from them. At the very least, we can learn what directions have not worked out in a research program and what efforts not to repeat. Now, if you write a paper describing negative results—a model where nothing is significant—then you may have a hard time getting it published. In the absence of some specific controversy, negative results are boring. For the same reason, though, if your results just barely cross the threshold of conventional significance, they may stand a disproportionately better chance of getting published than an otherwise quite similar paper where the results just failed to make the threshold. And this is what the graph above shows, for papers published in the American Political Science Review. 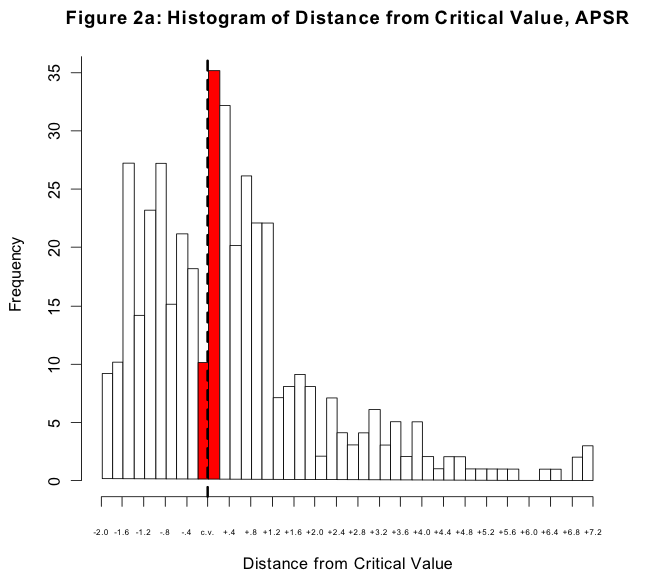 It’s a histogram of p-values for coefficients in regressions reported in the journal. The dashed line is the conventional threshold for significance. The tall red bar to the right of the dashed line is the number of coefficients that just made it over the threshold, while the short red bar is the number of coefficients that just failed to do so. If there were no bias in the publication process, the shape of the histogram would approximate the right-hand side of a bell curve. The gap between the big and the small red bars is a consequence of two things: the unwillingness of journals to report negative results, and the efforts of authors to search for (and write up) results that cross the conventional threshold. An old post from Crooked Timber on successfully gaining a spot on panels at academic conferences. Possibly useful as we begin to head into proposal season again. This is my first time at Princeton, so I thought I’d walk around the campus a bit today. And dinner tonight before our workshop begins tomorrow was also quite fun. I do enjoy getting together with these people; they’re the very few with whom I can talk about HIV as a political scientist, using our language and analytic methods. Plus they’re just generally nice, congenial, and collegial. I am now officially All But Dissertation. Two more years to go, I hope. I’m here in Berkeley, for a conference related to my dissertation research. It was four younger scholars, moderated by a senior faculty member in the sociology department at Berkeley. What was great about was that it got me a bit out of the bubble of my friends and committee at Harvard. They’ve been enormously helpful of late, but the Berkeley group of people travel outside those circles and haven’t seen what I’m up to of late, so the aspects they notice are different. It’s also nice to have a bit of validation that what I’m doing is worthwhile and that my ideas aren’t completely cracked or crazy. People found my basic model persuasive and possibly useful. Anyway, I walked away from it all feeling quite positive, buoyed, and ready to get a bit more work done. Six days to the prospectus conference…. Alicia Shepard writes about being a teacher in an era of grade inflation. not really in charge of the grading standard. do the best they can do. fellowships and job applications who received the position(s). but if that were entirely true, they wouldn’t have selected someone). and get cracking on a data set this summer. last semester in the social theory class I took. now, and I hope this picks up a bit on the second question. Light blogging (like that *hasn’t* been the trend of late) to ensue. Apparently, Harvard undergrads are unhappy about several features of the educational experience. that. I’m not sayng it should be this way, but it is, and the model is much larger than simply Harvard. be high quality and high intensity. in terms of tenure or advancement. chance. Maybe ten percent, from what I have seen so far. was in college, I got to know two of my professors quite well. will or won’t come to office hours, based on their own personalities. Students’ experiences also vary widely from department to department. hold a party on-campus, where almost all undergraduates live. amount of athletic equipment in the main gym used by undergraduates. the content of their social lives. Powered by WordPress v 4.8.1. Page processed in 1.133 seconds.